The Monocultural National Us wreaks havoc all over the world. How do we loosen its grip on our imaginations, and what might this mean for the defence of our democracies? Pt.3 of 4. 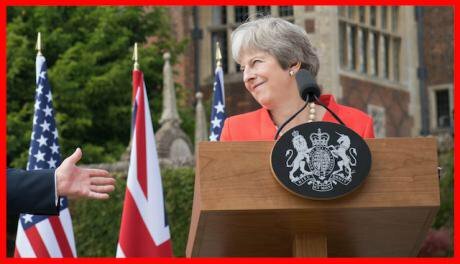 Donald Trump and Theresa May hold a joint press conference at Chequers, July 2018. Stefan Rousseau/ Press Association. All rights reserved. This is the third part of a 4-part article exploring the concept of the Monocultural National Us in Europe and beyond. See other parts in Related Articles. I want to apply the criteria for a ‘healthy nationalism’ sketched in part two to two cases of the Monocultural National Us that have been causing havoc in our midst: the use of the word Zionism as a pejorative; and the two warring versions of ‘Us’ in Brexit Britain. Here it is an altercation between two Facebook posters. It strikes me as mild but typical in the long-gathering process of accusation that has accompanied any enlightenment the IHRA definition (plus examples) of “anti-semitism” has afforded since it reappeared over the horizon, despite noble attempts since the OSCE Berlin Declaration of 2002 kick-started this process, to point out its inherent flaws. Here, GLG and RE are discussing "a thoughtful and thought-provoking piece on this thorny topic." “GLG When I claim to be anti-zionist, what I mean is I am opposed to the colonialist actions of a succession of Israeli governments - especially the current one under Netanyahu, and the Settler Movement. Who, aided and protected by the IDF, are blatantly evicting Palestinians and taking their land and property for themselves. I also hold the strong conviction that Israel should withdraw to its pre-1967 borders and that all sequestered lands should be returned to their rightful owners. I do NOT mean reversing the historical fact of Israel's creation, even though I do believe that the way that it was done in the first place was grossly mishandled - for which the UK is most to blame. What is interesting about RE’s response is that it contains no criticism of GLG’s analysis, but warns against the offence that may nevertheless be given attached to the role of the ‘anti-Zionist.’ This is meant to be a helpful warning. But it is a confused one, and repeated in many places, has led to a chilling effect on debate around the relationship of Israel and Palestine, when that debate is surely crucial for progress in the world. It is a confusion at many levels, beginning with the fundamental problem shared by definitions of antisemitism with hate speech legislation generally, the minute it moved beyond the relative clarity of ‘incitement to violence’, which is that the meaning of language is crucially determined by context, and that exactly the same phrase can mean completely different things uttered by different people in different situations. Even statements calling for the destruction of the state of Israel mean something very different when yelled by a young Palestinian, trapped in the Occupied Territories and humiliated by the experience of occupation, from, say, the opinion of a Middle East military man with influence over the development of a nuclear arsenal in his country. I hope I may be forgiven by him for what follows, on the grounds that it is Zionism as a term of political philosophy that concerns me. In the accusations and counter-accusations around the term Zionist, I want to argue that what those who are avowedly anti-Zionist often fail to articulate is the Monocultural National Us which lurks implicitly in its definition, with all the results in terms of violence that concern us most about bad nationalism. When they spell out what they criticise about Zionist support for the Israeli state, there are controversial analogies with apartheid, disputes about the precise nature of a colonial-settler state, all sorts of ways of trying to pin down what is uniquely appalling to them about Israeli policies with regard to Palestinians. All versions of course are furiously pushed back, and accompanied by the statement that has been given new topicality by Trump’s decision to pull out of the ‘cesspool of political bias’ which he alleges is the UN Human Rights Council, on the grounds that Israel is being singled out for special opprobrium in a way that can only be antisemitic, when there are many other – the implication is far worse – transgressors who are even members of that Council. Trump doesn’t attempt to explain, of course, why the US singles out Israel for its special protection, considerable support and military alliance, one reason for the dismay in what used to be thought of as the free or civilised world at the impunity with which Israel acts towards the Palestinians. The Zionist state claims to be especially for Jewish people: in fact it goes out of its way to offer Jewish people everywhere a special access to its citizenship. In this regard, and because Jewishness is linked to race and religion, it is very easy to make the mistake of seeming to criticise Jewishness when criticising the actions of the Israeli nation state. And it is not quite so simple as following the advice that one should always differentiate between criticism of the state and criticism of the Israeli people, in a situation in which so many Israeli citizens seem to have bought into the Monocultural National Us. However it is not surprising that they have. Given the history of antisemitism, fear and violence in which the state was born, it is actually almost obvious that in this context the ‘Never again’ of World War II should with very little encouragement become, let us always have the upper hand and never be weak or frightened again. And as we have seen, that is not a million miles away from the basic building bricks of the Monocultural National Us, which always in the end requires a Them. So it is not at all surprising that internally in Israel, the exclusion and discrimination against its Palestinian minority (around 20 per cent of the population) has become entrenched over the years in laws that are deemed to “preserve the ability to realize the Zionist dream in practice”. It is not surprising that human rights, particularly minority and migrant rights are on the run in Israel, or that the Knesset Presidency recently disqualified a bill named: “Basic Law: Israel [is a] State for All its Citizens”. And it is not at all surprising that the projected external enemy that always returns to threaten one’s peace has been steadily turning the Occupied Territories into a large open air prison that is a reproach and scandal to us all. Because this is the logic and inevitable destiny of the Monocultural National Us, and it is precise to criticise Zionism as the political philosophy which underpins the Israeli state, because it is (or has become) this type of National Us, backed by the violence of the state that Zionism is committed to, and it is in the nature of that same economy of desire that, unless it is recognised for what it is and stopped, it must lead to all this violence. But doesn’t Trump have a point? There is something extremely normal, even mundane, about what is wrong with the Israeli nation state in its response to Palestinians, and it is not very different at all from the European nation-state that was its model, only differing recently in the degree of violence internal and external that it has been willing to undertake in perpetuation of that model. What we are meant to conclude from these warning definitions is that an Israeli democracy so constituted has as much right to pursue such policies as any other democracy similarly constituted. But Rose’s point is the opposite one: that the rigour with which Israel pursues the defence of a state based on racial and religious unity makes it a stark and leading example of the inevitably racist and self-defeating outcome of ‘organic nationhood’. And not only ‘organic nationhood’. At a time when most European countries are engaged in a decisive worldwide swing towards the defence of various monocultural constructions of the ‘National Us’ – for example, not just Hungary or Poland, but the re-Christianisation of Italy, the re-laicising of France, Brexit Britain – and what’s next, a central European “axis of the willing against illegal immigration” ? – not to mention Trump’s United States, the Russian version including its “liberal-nationalist cocktail”, and the staggeringly violent Turkey, India – we could go on – there are timely and important conclusions we might indeed draw from the Israeli experience that these formulations, like the Facebook poster RE, are instead aimed at removing from contestation. So I hope we will continue to debate the nature and effects of Zionism, as we consider the banality of evil taking place all around us. Because this is one way to show solidarity with the predicament in which the Israeli people find themselves, and do more than bear agonised witness to the violence that results. Meanwhile, if this argument is to be taken seriously, popular movements like Standing Together, pioneers in the social change that can liberate Israelis from this lethal logic, are an avant-garde from whom we all have much to learn. In investigating nationalisms we have been talking about fictions that seem to amplify the power of the individual at the same time as they enrich our lives in their lived reality. These fictional realities are essentially ideological formations, and ideologies always have exactly the dual character that we have been exploring here. Are they false? Not at all. The nineteenth century novel can tell us more about life then than many a drier document of fact. At the same time, we recognise that the fiction has other intentions. It is designed to produce pleasure, promise a happy ending and perform other functions not strictly to do with reflecting reality. The same is true of ideologies. These visions of what we have in common can really unite people, and they can exact enormous sacrifices. They can be rich and revealing in their vocabularies and their assumptions about the world. Moreover, there is no form of lived reality which can detach itself from ideology to know the world directly, without any vocabulary or assumptions. At the same time, in having the function of making sense of our world, ideologies necessarily aim for closure. They do this in many different ways, all summed up in the classic Marxist reading in the function of repressing contradiction by producing a smooth surface over reality – hence the unitary or monocultural compunction. This smooth surface holds for a while, making us feel whole, until history and the world moves on, and then, as with the NHS or the BBC, the contradictions in the narratives we use to explain our experience begin once again to disturb and fragment that surface. For this reason, ideologies are simultaneously our only way of knowing about the world, and a way of knowing the world which always and increasingly contains an element of not wishing to know. Bertolt Brecht, that canny baiter of dominant ideologies in his time, surely put his finger on one key aspect of what nationalism didn't want to know when he wrote: “Unhappy the land that is in need of heroes”. By these accounts, the identification of the individual with the Monocultural National Us is an ideological move which represses the contradictions in which we live, in order to be able to assert our own importance and agency, in this case against the evidence of our subjection. We know who we are, is the statement. And we know if you are one of us. But today, too many people in positions of power behave as though they have more in common with international elites than with the people down the road, the people they employ, the people they pass in the street. But if you believe you’re a citizen of the world, you’re a citizen of nowhere. You don’t understand what the very word “citizenship” means. These are leaders of the people tapping into archaic managerial wisdoms, perhaps planned long before the financial crisis of 2008, but anticipating the fall-out of such an inevitable occurrence and knowing in those circumstances what they have to do. But I don’t want to concentrate on the very obvious Monocultural National Us that has arisen in our midst to Ukipise Britain’s Conservative party. You can easily fill in all the gaps for yourself, from what has been said so far, brought up to date by Adam Ramsay on the no-deal Brexit that Britain’s hard Brexiters never mention but actually want. Chillingly, this scenario is made more likely because of the impossibility of assembling positive majorities for any single Brexit option, since it is the only option that doesn't require one. So much for ensuring consent. Instead, I would like to point to a second Monocultural National Us that has been in formation since the referendum in 2016, and whose recent emergence in our midst leads to similar dangers. Anthony Barnett has written better than anybody on the two warring factions that have emerged from this toxic debate and polarised the country, in his ‘How to win the Brexit Civil War. An open letter to my fellow Remainers’. He is surely right to warn us against the violence lurking in the gathering confrontation, and implicit in the enemy images that he summarises. What he calls this “civil war” has already tragically claimed the life of one young and dedicated MP. Yet the winner take-all-character of the contest he describes continues in both camps. Neither ‘Us’ is sharing useable plans for the country’s future. They are too busy projecting their people as the whole people, either on the grounds of the scanty advantage of the referendum result, which is declared to be the ‘people’s will’, or on the thin grounds that Leavers must see that they couldn’t have been more stupid. The Remainers whom Barnett tries to chastise into a more respectful stance, have been calculating what it would take to reverse the referendum, 52%: 48% in their favour, given for example the demise of enough older Leave voters. They too have a certainty, a vision, of a quite different ‘people’s will’, better informed maybe – this is surely where Michael Sandel’s ‘meritocratic hubris’ has its provocative part to play? – but which still shows no real interest in the diversity of the permanently absent people whom they claim to represent. These two warring Us’s, taken together, mark the radical decline, if not the end of the élite manufacture of consent. And this is without even mentioning the illicit forces behind Cambridge Analytica, Aggregate IQ and the Vote Leave campaign, working very effectively for the élite manufacture of civil wars they intend to win. Yet this development marks an extraordinary moment in human affairs, when for the first time the future defence of democracy may depend not only on the ‘democratic media’ Adam Ramsay would bring to the rescue, but on giving internet users the rights of opting in (or not) to any dominant ideology with which they may be targeted.